When I bought my home, the one-acre yard was fenced by a graceful colonnade of Bradford pear trees. Their idyllic elegance sold me and my wife on the property. In the spring, I beamed with pride as their white blossoms created an elvish arcade of gleaming perfection. In the fall, they were the last remaining torches of autumn while my neighbors' trees stood ashamed by their nakedness. Sadly though, in the three years since we moved in, all but a few of our Bradford pears have fallen, snapped in half by windy nights and icy storms. Bradford pears, I've learned, are extremely fragile. Blind duty and time-honored devotion are relics of the twentieth century. It's a buyers' world out there and they're not afraid to change their minds, choose another, and drop you without a passing thought. 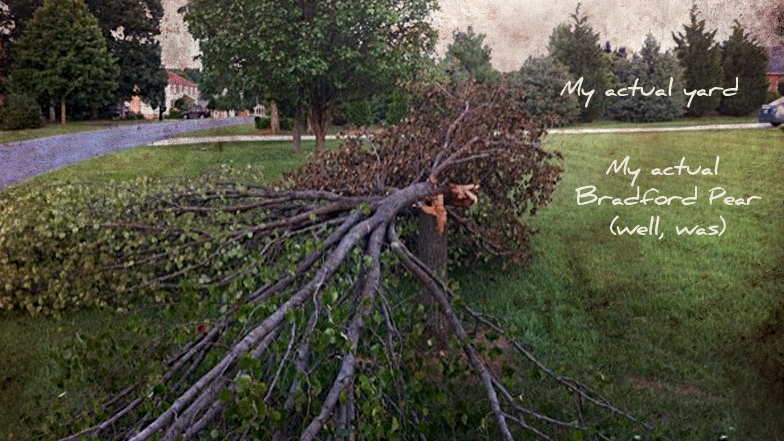 Your connection to your customers is as fragile as the trunk of a Bradford pear. Product quality, feature depth, and customer service excellence are all areas that help prevent customers from breaking away. But after a sale is made, what can you do as a sales professional to make sure the loyalty of your customers remains strong? That which keeps a customer relationship strong is the same as that which strengthens a Bradford pear - regular skilled attention. Too late, I discovered that Bradford pears are up to 75% less likely to fall when they're topped, pruned, and thinned routinely. If there's a crack in the trunk, an almost invisible metal brace can help it heal and remain sturdy. I couldn't save my trees, but I share the following to help you preserve your book of business and grow your strong colonnade of customers. Check in with them through the fullfillment process, after the product is delivered, and randomly throughout the year just to share your appreciation. Add a gift for emphasis. Random check-in's are perceived as the most thoughtful and therefore have the most impact. 2. Be their tenacious advocate. Fight for your customers. Battle your own company's policies and ambivalent staffers - if that's what it takes - to guide your customers to victory. Don't say you're sorry. Just call and apologize quickly with no defense or excuses. When you do, your customer will be disarmed and you can get to resolving the customer's issue and restoring their loyalty to 100%. 4. Share your expertise weekly. 5. Connect with them daily, socially. Use the same info you send in your weekly email update in your tweets, blogs, and Facebook posts. Release them throughout the week in sound bites, questions, and tips to offer your customers a chance to dialogue with you when it's convenient for them. 6. Let your personality shine. Remove all corporate speak and marketing language from your emails, proposals, and social media posts. When you write and speak with your own distinctive, genuine voice, your customers grow in their connection to you and the company you represent. 7. Create a memorable hook. I used to draw whimsical caricatures of my customers that were usually framed and hung above their desks. I'm an illustrator, so it worked for me. Find something from your personal skill set that you can employ to create a one-of-a-kind experience for your customers. 8. Help them in off-hours and overtime. When a vendor works a weekend or emails me late at night, I always appreciate their dedication to me, the customer. Never bring it up that you're usually off at five but you're willing to stay at work a little longer. Just do it and they'll love it. Many owners of Bradford pears are unaware that their trees, with proper attention, can be protected to flourish for years and years. The same is true of your customer relationships.